Robert Hogg (1817�97), son of a Scots nurseryman, was destined for a career in medicine, but abandoned his studies to pursue horticulture. Employed by a famous London tree nursery, he travelled widely in Britain and Europe to study gardening practice. This work, first published in 1851, was intended to encourage a taste for the 'most important, most instructive, and intellectual branch of horticultural science' - the cultivation of fruit. 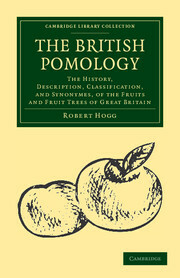 (The book is subtitled 'The Apple', as though further volumes on other fruit were intended, but none appeared, though Hogg did publish The Fruit Manual (also reissued in this series) in 1860.) It lists and gives detailed descriptions, including drawings, of 401 apples in cultivation in Great Britain, and a further 541 of which Hogg had no direct knowledge. He provides classification lists by fruit colour, shape, seasonality and region - a fascinating resource for the history of horticulture and of food. 328 pages. 70 b/w illus.